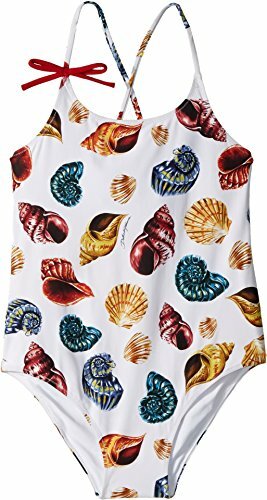 Add a splash of color to her swim wardrobe with the Dolce & Gabbana Kids™ Swimsuit One-Piece. Scoop neck, one-piece swimsuit. Sleeveless with thin, cross-over straps. Bow detail adorns the front right strap. Vibrant shell print throughout. Full rear coverage. Lined. Shell: 73% nylon, 27% elastane. Lining: 86% nylon, 14% elastane. Hand wash cold, line dry. Made in Italy. This item may ship with an attached security tag. Merchandise returned without the original security tag attached or a damaged tag may not qualify for a refund. Measurements: One Piece Length: 23 in Product measurements were taken using size 12 (Big Kids). Please note that measurements may vary by size. Add a splash of color to her swim wardrobe with the Dolce & Gabbana Kids™ Swimsuit One-Piece. Bow detail adorns the front right strap. Vibrant shell print throughout. Full rear coverage. Lined. Shell: 73% nylon, 27% elastane. Lining: 86% nylon, 14% elastane. Hand wash cold, line dry. Made in Italy. This item may ship with an attached security tag. Merchandise returned without the original security tag attached or a damaged tag may not qualify for a refund. Measurements: One Piece Length: 23 in Product measurements were taken using size 12 (Big Kids). Please note that measurements may vary by size.